What are the sizes of standard kitchen cabinets? Dimensions of kitchen cabinets refer as a determination of standard kitchen cabinets sizes in construction and remodeling industry. Stock or standard cabinets, are the products available from the store shelf with no special order requirements, and the sizes are very basic to satisfied low budget customer’s needs. 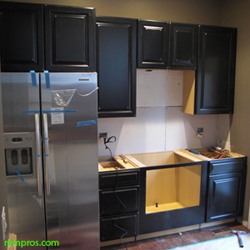 All custom made cabinets a made exact sizes to fit kitchen layout and house design exact. It is not a case in identifying the dimensions of custom cabinets which are made exact sizes and unique specification. First factor in analyzing standard cabinet’s sizes is a determination the type of a cabinet – wall or base. Second factor is identifying the cabinet style – one door or double door design. Drawer cabinets are not specified in a term of a size, but have analogous dimensions to doors cabinets. 9", 12", 15", 18", 21", 24"
12", 15", 24", 30", 36", 40", 42"
24", 30", 33", 36", 40", 48"
Not every manufacturer will include all available sizes in the standard production line, but using wood fillers and incorporation variety of kitchen cabinets dimensions allows getting standard cabinets fit to any kitchen size. All numbers in the chart are imperial characteristics for standard kitchen cabinets dimensions. European cabinets are not considering a standard, and might have its own specifications in metric system, but for the US market all dimentions in imperial system. What the dimension of pantry cabinet? Pantry or tall cabinets have the basic width as a rest of base cabinets and two common depth 12 or 24 inches in order to match with a rest of cabinets. They come in tree heights sizes – 84”, 90”, 96”. What size of the cabinet over refrigerator? Standard opening for refrigerator is usually 36” wide and standard size of the wall cabinet over refrigerator 36” in width as well. In some cases the cabinet has to be smaller or bigger depending on the fridge size. The heights will vary from 12” to 24” depending on the walls cabinets and how big the refrigerator is. Build in fridges are not the same and if you will choose one check the require allowances. What size of the kitchen cabinet over microwave or hood range? Standard size of a cabinet for over the range microwave oven is 30”wide and 12”, or 15” high, but some appliances comes in different sizes, and before buying the cabinets see kitchen appliances specification. Size of opening for dishwasher. While performing base kitchen cabinets installation 24” opening in width has to be left for a dishwasher with a full standard 34.5” height. Base cabinet for kitchen sink. Standard sizes of sink cabinets are 30”, 33” or 36” wide with a basic height. Such cabinets’ dimensions allow fitting most of the kitchens sink sizes. 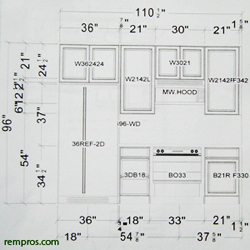 Specifications of cabinets for range and a cooktop. Standard sizes of cabinets for range and a cook top will depend on actual appliances dimensions, but most of them fit in 30”, 33” or 36” inches cabinets. Cut-outs for build in appliances. In many cases build in allowances has to be verified with actual appliances specification, but it is doesn’t mean it will impact the standard kitchen cabinets sizes. If cut-out for build in microwave 22”W x 14”H require it should fit in 24” wide standard cabinet. Why to use wood fillers? Because standard kitchen cabinets cannot match the kitchen dimensions exact using wood fillers is the only way to fill the extra spaces. What is a standard opening for a free standing stove? 30” width is a standard dimension should be left for stove unless there is a special custom stove will be installed. Why we are shopping for standard kitchen cabinets? The price is a main factor of popularity when it comes to a stock option. Cost of kitchen cabinets installation as well as prices of cabinets itself in standard sizes significantly lower in comparison with semicustom or custom option.